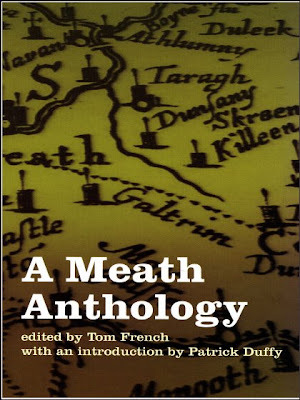 A Meath Anthology is being launched in Navan Library, Railway Street, Navan this Wednesday evening 30th June at 7.30pm. This poetry anthology contains poetry with Meath connections by such notables as Seamus Heaney, W B Yeats, Jonathan Swift, Evan Boland, Thomas Kinsella and Michael Longley. Many Meath-born poets are also included including Meath Writers' Circle Tommy Murray and our own member Eamon Cooke. The 140 page collection has been edited by poet Tom French and has an introduction by Patrick Duffy. The judge has done his work, the final results are in, the first, second and third prizewinners have been informed. The result will be officially announced at the opening of the Trim Swift Festival on Thursday evening next and put on the website very soon afterwards. Well done to all who entered and to those who were shortlisted. The Battle of the Books is the next item on the agenda. Our team is (more or less) selected. The satiric pieces have been written (maybe a little fine tuning here and there). It's too late to have a big discussion about what satire actually is. Rehearsals planned for this week. Last year's event which we won took place at an evening function, this year's is an after lunch event. Maybe a different ambience, an audience less well watered, less likely to respond to feeble attempts at satire. Possibly a more challenging gig! Our spies tell us the the opposition Meath Writers Circle have left no stone unturned in their preparation. Late night rehearsals, constant rewriting, rejection of anything less than the best. It's going to be tough. The fact that two members of the Circle were shortlisted in the Swift Satire Competition shows their quality. Take the Battle of the Books seriously? Of course not. It's just a bit of fun. We don't mind who wins. 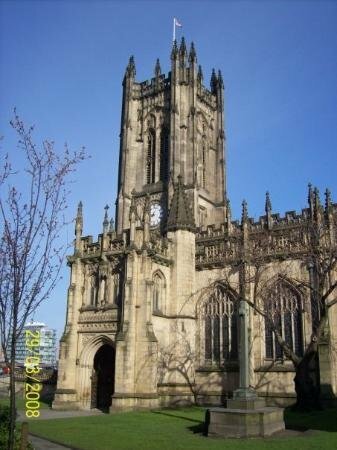 Closing date for the Manchester Cathedral International Religious Poetry Competition is 30 June. Last year over 370 people sent in over 900 poems. No online entry so you have to get a sterling draft or similar. I emailed them last year and asked if they would accept a sterling note. They said no. I got a postal order on Friday week last in Derrylin in Fermanagh on my way to Kiltyclogher so I'm entering again this year. Maybe even the same poems as last year because there is a different judge. Irish poet John McAuliffe judged last year and this year Irish poet Vona Groarke is the judge. 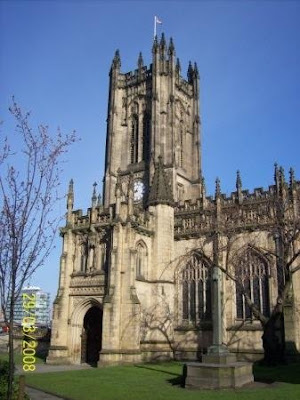 She is a lecturer at the University of Manchester Centre. Her poetry collections include Shale (1994), Other People's Houses (1999) and Flight (2002). I have a feeling that my poems are too religious for this competition but anyway I'll give it one more go. If I get nothing this time that's me finished with religion!! I didn't have to use the new suit, they provided one from RTE wardrobe. The legs were far too long but they only filmed from the waist up so that was OK. A nice shirt and bow tie also though the white coat covered all. I was the pathologist who in performing the post mortem discovered something in the dead persons eye which was crucial to the investigation. So that must mean I'm the hero of the story. My glasses were too modern so I appear in my RTE debut without spectacles. It's an episode in RTE's documentary series CSI Fada about a case which took place in Athboy and Ráth Chairn Gaeltacht in 1946 and will be shown sometime in the autumn. My small part took two hours to film in Ráth Chairn community Centre and probably will last thirty seconds in the film - but a very important thirty seconds. Other parts were filmed on the main street in Athboy and in a house in Ráth Chairn. Bláthnaid Ní Chofaigh who grew up in Ráth Chairn knew of this story and seems to have been responsible for it being filmed. She made no comment on my acting though, is that good? At least ten other extras from Trim Drama Group were used in the filming, I'm told the courtroom scene was particularly good. More charity collecting tomorrow. POETRY IN MOTION - POETRY WITH A BEAT ! 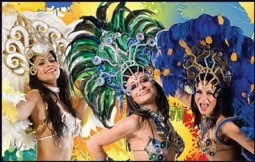 As part of the Drogheda Samba Festival, the Viaduct Bards are organising a Poetry with a Beat event on Saturday 26 June between 3-5pm, Droichead Arts Centre Cafe Bar, Drogheda. They are calling on all poets to perform their own work. If its got a beat, a rhyme or a good rhythm they want to hear from you. Also there will be poetry readings in Droichead Arts Centre cafe/bar on next Wednesday 30 June at 7.30pm. All welcome to come along to read - poems, short stories or short memoir piece. If reading short story or memoir piece please keep it to under 2000 words. Today, charity fundraising in Navan then on to Rath Cairn for filming. I'm playing the pathologist in a recreation of a 1946 case. They wanted someone with the John Harbison look. They said wear clothes suitable for the time. The suit I bought last year should be perfect. On the journey to Kiltyclogher last weekend, just outside Blacklion Co Cavan, I came across this sign which impressed me. A poet is remembered, and a poet in Irish at that. 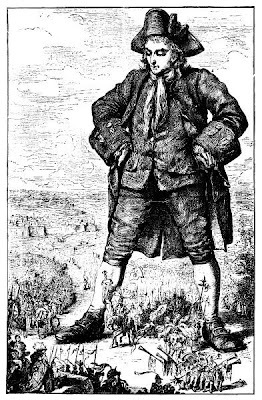 Of course Cathal Buí Mac Giolla Ghunna (c1680 - c1756) is remembered especially for his famous An Bonnán Buí where he laments in comic mock heroic terms the death of a little bird from thirst and taunts those who warn him that he himself will die of drink. Thomas MacDonagh's translation of the poem is how most people came across Cathal Buí. McDonagh, like Seán MacDiarmada, was executed after the 1916 Rising. And then Francis Ledwidge referenced the Bonnán Buí (Yellow Bittern) in his Lament for Thomas MacDonagh. 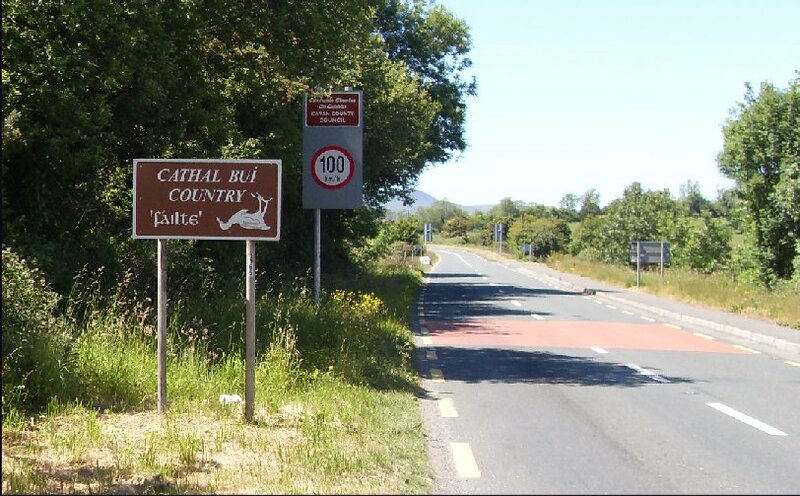 There is a Féile Cathal Buí in Blacklion Cavan from the 24 to 28 June. I'm spending most of today bagpacking for charity in Navan. Tomorrow also except for a few hours as an extra in a TnaG documentary. A good entry for the Swift Satire Competition, organised in conjunction with the Trim Swift Festival, much the same number as last year, almost half and half male and female. A great geographical spread, USA, Canada, Costa Rica, Kilmessan, Trim. Tommy Murray, Trim, A time when we were inclined . . . The winners will be informed next week-end and the winner invited to the official opening of the festival on July 1st to read the winning entry. Thanks to all who entered. 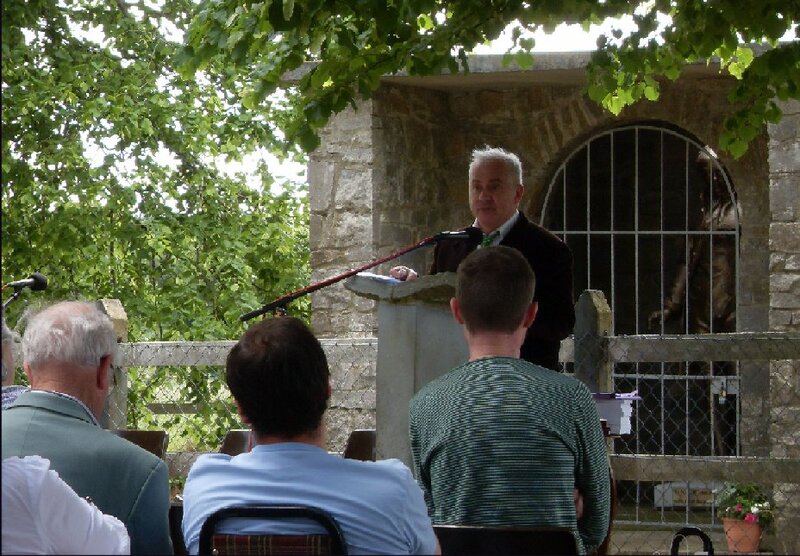 The Seán MacDiarmada weekend was a great success and very enjoyable. I went there quite nervous because I have been out of the history scene for so long and because I was the only speaker not presently working in a history department. Also I wasn't confident that my presentation was exactly suitable. As it happened the presentation went down well, the other speakers were a great bunch, the organisation was terrific, the attendees were enthusiastic and the north Leitrim countryside was beautiful in the sunshine. Because the summer school is named for Seán MacDiarmada who was born in Kiltyclogher and was executed after the Easter Rising there is the feeling that maybe the weekend should be in some way be a celebration of what he stood for. In fact the academic programme organised by Leitrim native Dr Jennifer Kelly of the History Department, Maynooth University, is nothing of the sort. Last year the topic was the Rising, this year the War of Independence. Speakers interpreted the theme freely. 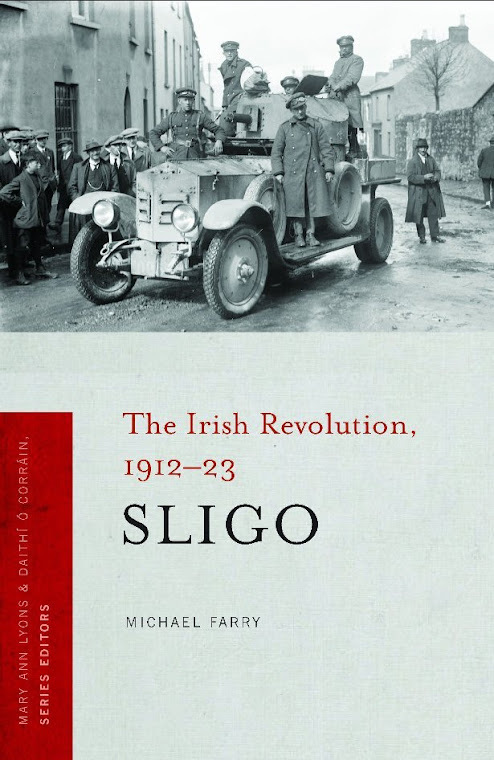 My talk dealt with politics in the 1914 to 1918 period and the complete change in Sligo from support for the Irish Party to support for Sinn Féin. Others spoke on the treatment of Protestants in North Connacht, the Intelligence war in Limerick, The National Aid Association and the attitude of Catholic clergy to the war. The final speaker, Dr John M Regan, spoke of the way the "troubles" in the North of Ireland affected the way historians deal with the earlier conflict. This led to a lively debate on "revisionism". The audience was invited to ask questions after each session and contribute to a round table at the end. Their participation was lively and sharp and contributed a lot to the debates. 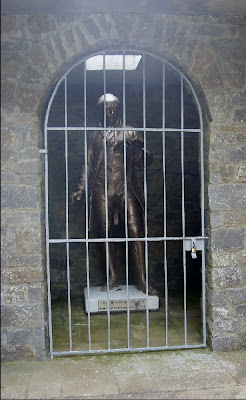 Above: The monument to Seán MacDiarmada in Kiltyclogher by Irish sculptor Albert Power RHA (1881-1945). I think I've got the history bug again! At the front of the house are the foxgloves. These take two years to grow and are worth the wait. These ones are as far as I know common wild foxgloves. I collected some seed from wild plants some time ago, threw it in the garden and they come up every year in all kinds of places. None flowering around the back this year though. a lady's narrow, faithless, foxy hand. Also a poem here by Jude Nutter features the flower and they get a brief mention in this Elizabeth Bishop poem also. I'm in Kiltyclogher, Co Leitrim this weekend, speaking at the Seán MacDiarmada Summer School on ‘From Parliamentary Party to Sinn Féin: Challenging Authorities in County Sligo 1914-1918’. 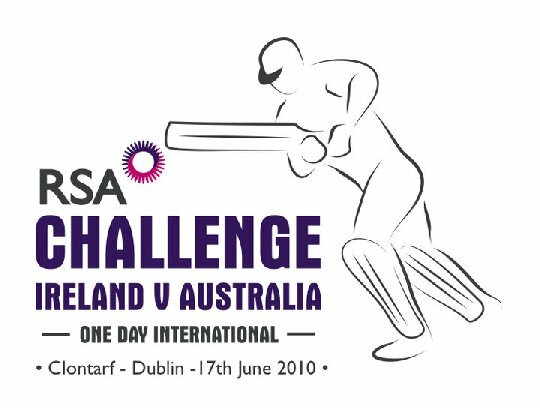 This was actually the first live cricket match I ever attended (That doesn't sound right somehow, can you attend a non-live cricket match?). Anyway I've watched lots of cricket from test matches to 20/20 games. 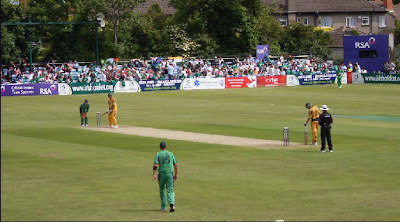 This was a One Day International, 50 overs each. The ground was full, the weather was fine and the cricket varied from very good to not so good. The Irish bowling was good and limited the Australians to a not very impressive total. The Irish opening batting was excellent and started at a great pace. The lower order batsmen disappointed and gave up wickets too easily. Tail ender John Mooney gave the Irish followers something to cheer about by making a stand of 38 and they went home happy talking about what might have been. It started at 10.45 and ended about 5.40 with a 45 minute break for lunch. It's a great contrast to the rush and puff of those shorter 80 or 90 minutes long games. It changes every few minutes as one side then the other takes control. It's one against man in the centre and each new ball is a new test. I'm not going to write a poem about cricket you will be delighted to hear though there is a cricket poetry competition here. Anyway I wouldn't be able to enter because I do not reside in one of the full ICC member countries! Brendan Behan's Captains and the Kings satirises this attitude well. 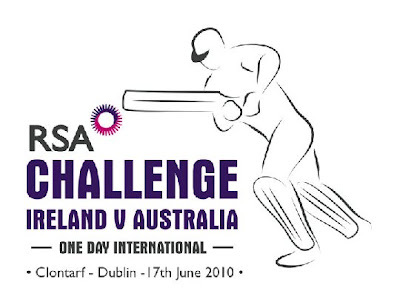 Off to Clontarf today to watch the Ireland Australia game. Cricket of course, a short game, 50 overs each, should be over before dark. Weather looks set to be favourable. Bag packed - sandwiches, fruit, hat, binoculars, notebook, pen, camera, a few suitable books (Gulliver's Travels, A Shropshire Lad, Les Murray Collected Poems), sunblock, iPod. Australian captain Ricky Ponting comments on Irish players playing for England. Well today is Bloomsday after all so I couldn't resist this. June blooms at their best in the garden. 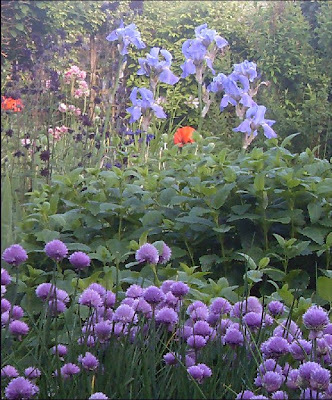 Irises, (nearly finished) Aquilegia (too many - must pull some out), Oriental Poppies (Spectacular), Peony Roses (Colour clashes are vital in a cottage garden! 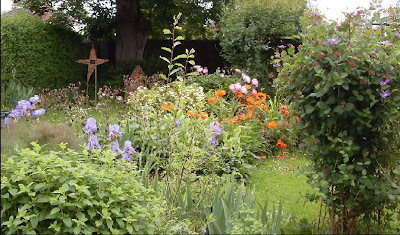 ), Cistus (The grandchildren call them the fried egg flowers) and the second Clematis to flower. My willow things in the background. 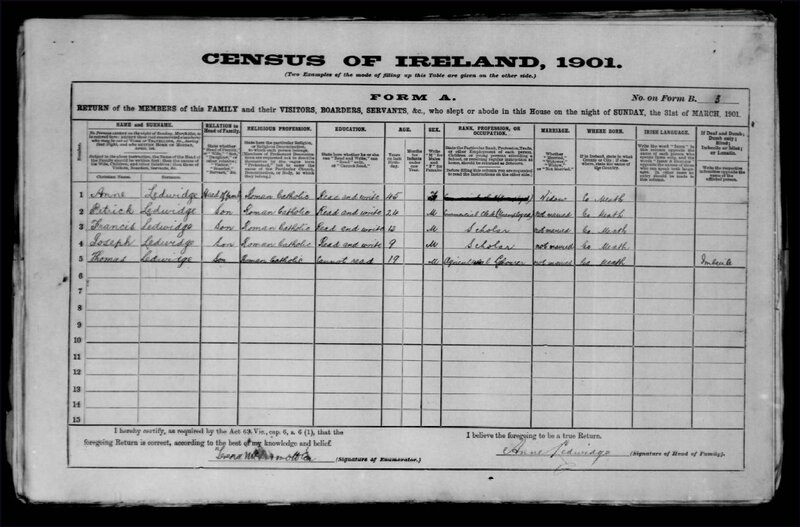 James Joyce's 1901 census form and I presume this is Norah Barnacle's census form. (Norah with a h!). Joyce first went out with Norah, who was working as a chambermaid in Dublin, on 16 June 1904, an event which provided the date for the action of Ulysses. They were in Trieste in 1911. 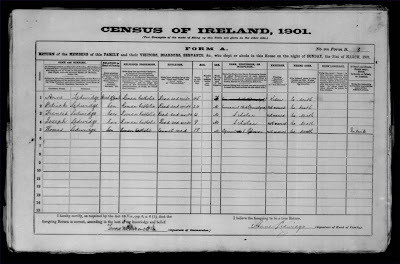 The National Archives have just put the 1901 Census details online. This means that as with the 1911 Census you can search the whole country for persons whose details were recorded on that night and view the actual census form which was filled in on 31 March 1901. Interesting to search for famous figures. 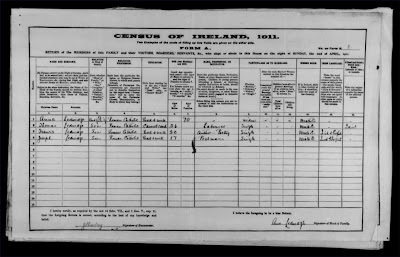 W B Yeats doesn't seem to have been in the country for either census, in London dreaming about the Lake Isle I suppose. 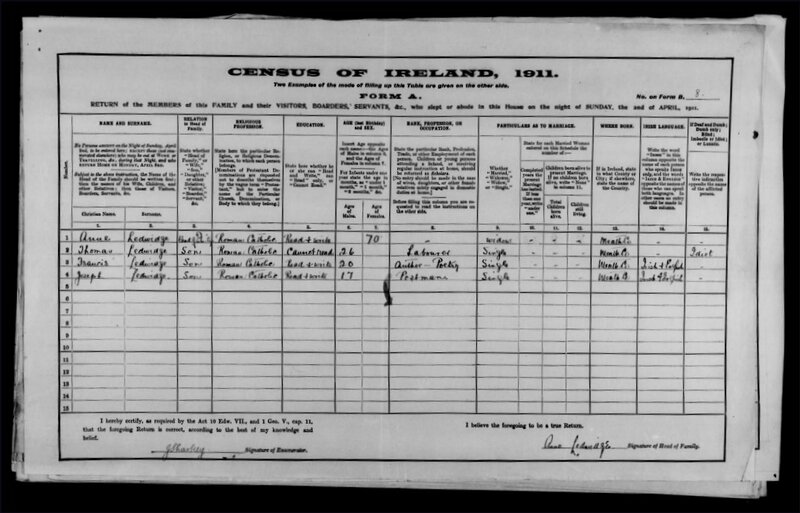 Meath poet Francis Ledwidge was at home both dates though and his census forms are very interesting. Ledwidge's father died when Francis was four. In 1901 his older brother Patrick is at home given as a commercial clerk - unemployed. He had contracted TB and had come home from his job in Dublin. By 1911 Patrick is dead. Francis gives his occupation in 1911 as author - poetry and his age as 20 though he was a year or two older in fact. Ledwidge's mother's age is interesting, 45 in 1901 but 70 in 1911. Ages in these census records are unreliable since at the time people often did not know their real age. Also the fact that old age pensions had been introduced in 1909 may have had something to do with it. Francis' older brother Thomas appears in both records, as an imbecile in 1901 and as an idiot in 1911. The use of these terms sounds barbaric to us now but they were in effect technical terms then in use as you can see from the heading of the column in which they were entered. Hours of interest browsing such a vast resource. Ledwidge's poem about his mother here. 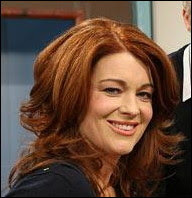 I met Shirley McClure when she was runner-up in the Patrick Kavanagh Poetry Award 2009 and I was joint third. I’m delighted to hear that her début collection of poetry, Who's Counting? 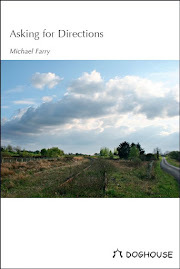 published by Bradshaw Books will be launched by Poetry Ireland on the 9th September. She is also giving a poetry workshop entitled The Poetry Vein in The Sanctuary, Stanhope St., Dublin 7 on Sunday 18 July. senses and the writer within. No blood will be shed. A newspaper report about a English councillor - a Shropshire Lad actually with a very Irish name - who preferred to listen to Dylan rather than say his prayers. What a terrible report. What is journalism coming to? 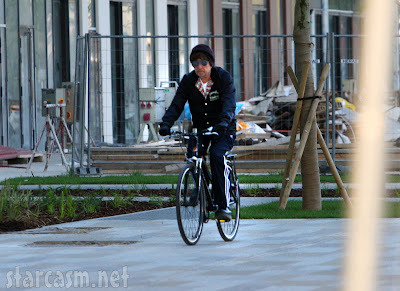 The most important fact is missing - what Dylan song or album was the councillor listening to? Blood on the Tracks? World Gone Wrong? Eric Idle taking off Dylan in the Royal Albert Hall. The lyrics could be better and it could have lasted longer. Until you find you're played by Cate Blachett. Bob is on a European tour at the moment, playing Thomond Park, Limerick on 4th July. Same day as Battle of the Books at Trim Swift Festival. How long does it take to get to Limerick from Trim? Picture: Bob pictured cycling in Bratislava during the week. The build up continues towards the 2010 Trim Swift Festival. The Stand Up Row devised by Committee member Paddy Smith is well under way in the town. This is an inter-pub competition and the final will take place the evening of the official opening of the Festival, Thursday 1 July. Great fun last night at the second leg of a first round contest. Each team member pulls a topic from a hat and after two minutes preparation has to speak for one minute for the motion then one minute against it. 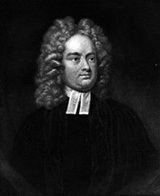 The contest is inspired by the fact that it is exactly 300 years ago this year that Jonathan Swift caused consternation in English politics by switching his allegiance from the Whigs to the Tories. Topics last night included I Hate Potholes, I Love Sunday Mornings, Old Men in Pony Tails are Pathetic, I Hate the Judges. A variety of styles, loud, quiet, serious, flippant, great audience reaction, opinionated judges - a good night. Thursday 1 July will also see the presentation of prizes in the Swift Satire Competition which our group is organising in conjunction with the Festival. Satiric prose or poetry on the topic 2000-2010: The Best Of Times, The Worst Of Times. Entries have been coming in steadily, from near and far, including USA, Canada, Costa Rica. Full details on the website. closing date for entries 15 June. You can enter online. On Sunday at the Goldsmith International Literary Festival Richard Halperin and Chris Agee read each for about 20 minutes. These truly are international poets, at home in Ireland, Europe, the USA. Richard Halperin's debut collection Anniversary is due out from Salmon Publishers sometime this month. Most of what he read came from this volume. His introductions were short and his poems flit about, sometimes using more than one narrator, sometime questioning the listener/reader, sometimes the writer. Many poems are about absences of a loved one and they are set in various places and in various times. The reading made me want to buy the book and study the form and structure of the poems. Chris Agee's most recent collection is Next to Nothing which records the years following the death of his four year old daughter Miriam in 2001. 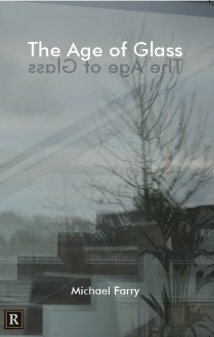 One sense of the title, Chris explained, is that the book and the poems are nothing compared to the loss itself. Chris spoke freely and at length explaining the circumstances of the poetry. I was especially impressed with the section entitled ‘Heartscapes’, from which he read a number of poems. This consists of 59 ‘micro-poems’, as he called them, extremely short, written during a very bleak time. His intention was to try to record true and deep ‘heart-feeling’ itself rather than the response to that feeling. 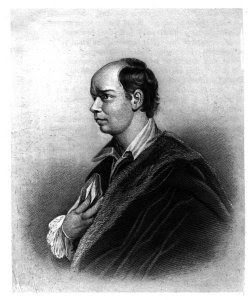 Richard W Halperin has authored Reading and writing poetry: the recommendations of noted poets from many lands on the teaching of poetry in secondary schools for UNESCO which is available for download here. Chris Agee's Next to Nothing was shortlisted for the inaugural Ted Hughes Award for New Work in Poetry. Congratulations to the Goldsmith Committee on a great event in a beautiful setting. 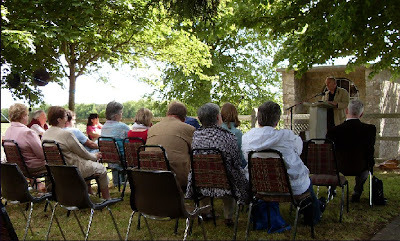 A great event yesterday at Oliver Goldsmith's birthplace, Pallas, Co Longford, the Goldsmith International Literary Festival Poetry Readings and Prizegiving. 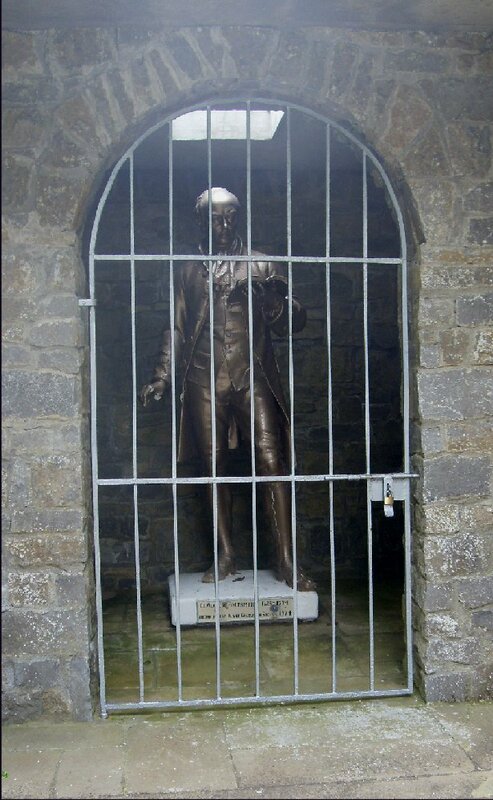 It's a wonderful setting, Goldsmith behind bars ( a plaster cast of the Trinity College statue) on the foundations of his father's residence, a natural reading room formed by leafy trees, birdsong to accompany the readers and Joe's cheese and wine to keep energy levels up. Poet Chris Agee called it the most beautiful outdoor venue I have ever read in. Anne Tully of the Goldsmith Literary Festival Committee did a fine job as MC. and poetry judge Mary Melvin Geoghegan (below) delivered the results and comments on the selected poems with enthusiasm and a genuine delight at the high standard. 3. Siobhan Flynn Joining the Women. We read our poems to a very attentive and appreciative audience. I often wonder about introductions to poems. Because the judge had spoken about ours it seemed right not to do any introductions ourselves so we just read the poems and this worked well. I was afraid the audience might miss some of the references so this made me work harder on the reading, pauses, emphasis etc. I was pleased with the result. The other two poems were excellent and I felt as I often do at these occasions I wish I could write poems like that. Chatting with Mary Melvin Geoghegan afterwards we agreed on the need to move beyond comfortable storytelling and anecdote-relating in poetry. Prizes were also given out for schools poetry competition, primary and post-primary and those that were read were a delight, un-selfconscious and free. Then readings by "acclaimed poets" as the programmes put it - Richard Halperin and Chris Agee. More about those later. May and June are the best months in our garden. The Clematis on the arch has just finished flowering. 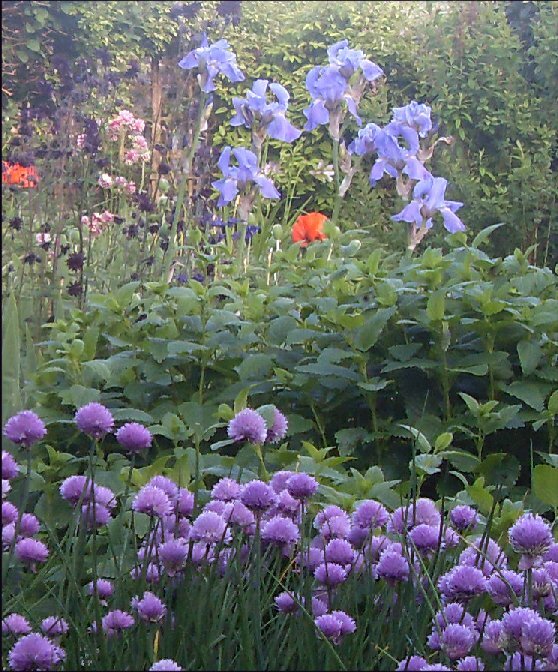 The chives and iris are in full bloom and the first few oriental poppies have opened. In a week or so that garish red of the poppies will be outstanding. 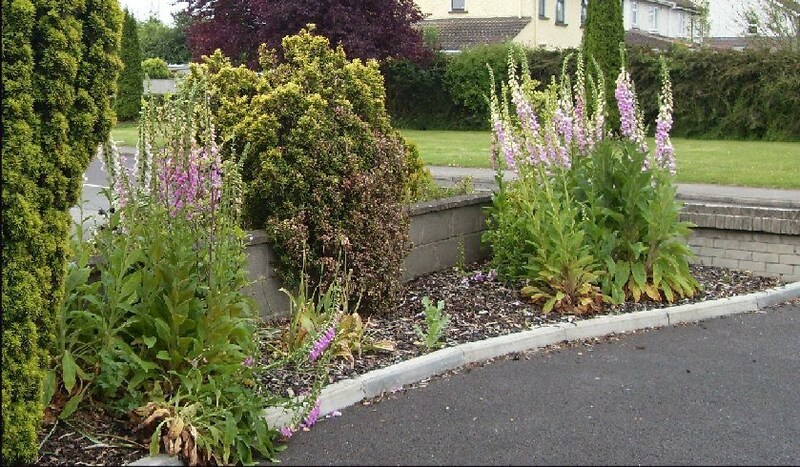 Some information about wild iris (flaggers we called them) here on this Irish Wild Flower website. Two Plays: Strange are the Ways of Pegasus & Faint Voices by the Dungarvan Dramatic Club in the Droichead Arts Centre, Stockwell Street, Drogheda. Tickets are available at the Droichead Arts Centre or call 041-9833946. Price €10 (Running Time 90 minutes). The first of the two plays is devised by Margaret Dennehy and is a multi media presentation which spans the life of the poet. This piece provides a backdrop to the second play Faint Voices By John McKenna, which dramatically portrays the doomed relationship between Francis Ledwidge and Ellie Vaughey as well as the impact of his death on the battlefields of World War 1 on those left at home. Both plays contain some very poignant moments and both feature extracts from Ledwidge's poetry. 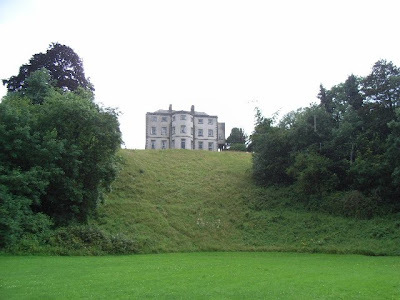 The highly popular annual walk will re-trace some aspects of Ledwidge’s life with a walk in the beautiful grounds of Beauparc House. To participate in the walk please contact the Francis Ledwidge Museum for a sponsorship card at email: info@francisledwidge.com or phone: 041 9824544. Alternatively you can arrive on the day and make a contribution. 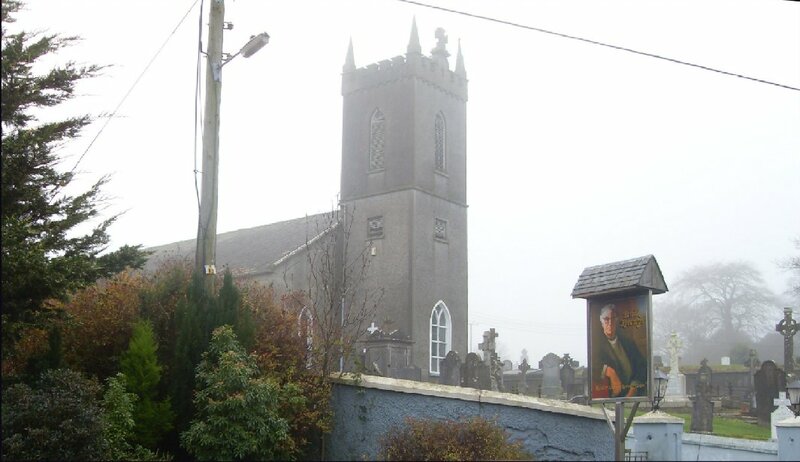 Off to Goldsmith Country, Co Longford this Sunday for the Goldsmith International Literary Festival. I was lucky enough to get second prize this year in the poetry competition for a poem entitled Journey Back. A pretty good poem, though I say it myself, which was written recently as a result of (I avoid the phrase inspired by) seeing an exhibition in Solstice Arts Centre, Navan by artist Catherine Delaney entitled Pile in which she used unwanted clothes dropped in by Navan people. My poem imagines all the clothes I ever wore stretched between Trim and Carrowloughan, Co Sligo where I was born. 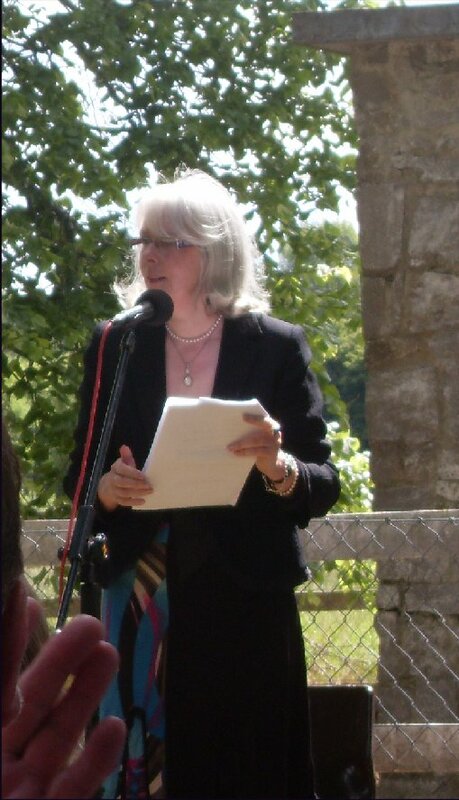 The judge for this year's competition was the wonderful poet and excellent judge of poetry, Mary Melvin Geoghegan. I also got second prize in 2008 in the same competition. The judge that year was the equally wonderful Jean O'Brien. Reading old newspapers is fascinating especially the things you come across which have nothing to do with what you are looking for. 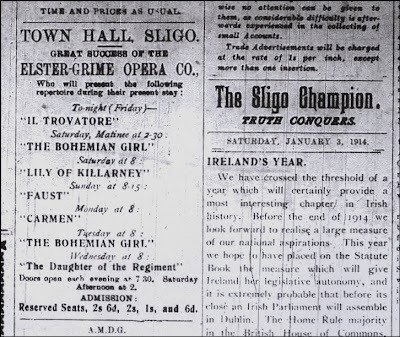 If you lived in Sligo in January 1914 you might have been interested in politics in which case you would certainly have read the Sligo Champion editorial on how 1914 was going to be the year of Home Rule when an Irish Parliament returned to Dublin (The Great War put paid to that!). You might in fact have been more interested in the feast of opera in the Town Hall all the week with six different shows available. The company was the Elster Grime Company from Wexford I think. Could I go to see Leah tonight, I wonder. I said I. Or the Lily of Killarney ? Elster Grimes Opera Company. Big powerful change. Wet bright bills for next week. 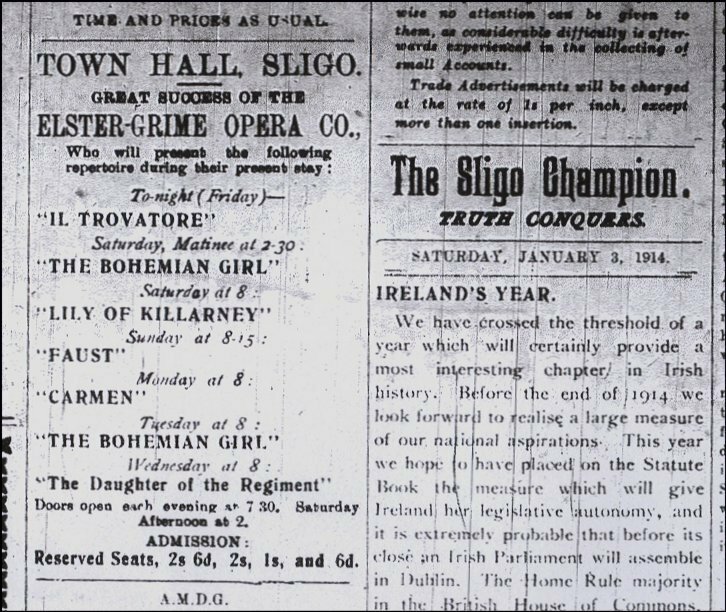 The company was performing Lily of Killarney at the Queen's Royal Theatre in Dublin on Bloomsday 1904 though Joyce got the company's name wrong - Grime not Grimes. I'm thinking of using that line or a similar in my piece for the Battle of the Books at the Trim Swift Festival. Did I mention . . . ? Anyway that's all because yesterday I travelled on the Luas from Windy Arbour to Stephen's Green. A great way to go. Got a free copy of Metro Herald as well - designed to be read on a short Luas journey. The challenging Metroku (Sudoku) took three stops to do - it is difficult to fill in when hanging on to a rail. The best thing in the newspaper was the cartoon above by Rick Brookes.